“It seems like the darkness has lasted so long and now in the silence of this night I feel with a deep joy, the breaking light of your presence. Welcome, Lord! Tuesday while running an errand for Patti I ran headlong into a “darkness to light” experience, she wanted to give me a gift for Christmas and because she wasn’t feeling good she couldn’t get herself. It was something she really wanted to me to have so she told me to go pick it up myself. The store I went didn’t have any so I went to two other stores with no luck. When I returned home and told her I couldn’t find any she was disappointed and was sorry I wouldn’t get it. But because she wanted me to have it I searched the internet and found one at another store about 30 miles away so off I went. It was on the return trip the Holy Spirit accidently on purpose caused me to have a head on crash with a deeper meaning into the giving and receiving of gifts (not just physical gifts but ALL gifts). I discovered the desire to give a gift is as equally important (and maybe more so) as the gift itself. Many times we get excited about getting gifts that we forget the passion of the giver. Had I been unable to find her gift anywhere just knowing how passionate Patti wanted me to have her gift was the real gift, her real gift was the gift of love and luckily the gift itself was wrapped neatly and under our tree. 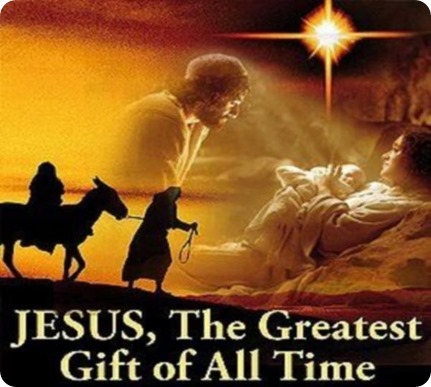 We often see Jesus’ birth as a gift from God. This Christmas through Patti’s gift I now have a deeper understanding of not only her love for me but also for God’s love for me. The real Gift of Christmas is God’s passion and desire as he extends himself so he can have a relationship with each one of us individually and collectively. MERRY CHRISTMAS FROM PATTI AND GARY PIPER! I love when the Holy Spirit gives me a good whack up side the head with a two by four. Merry Christmas. That makes at least two of us! Merry Christmas!